The cold and clear mornings we have had recently provided a few opportunities to get some good observations of Comet Catalina C/2013 US10. After reading about the many comets that were visible through small telescopes and binoculars, on the morning of January 5, 2016, at 5:15 am, I thought I would take a shot at locating Comet Catalina with my 9x63 binoculars. Using the comet finder chart provided online by Sky and Telescope magazine, the comet was shown to be located a few degrees north of Arcturus, the brightest star in the constellation of Boötes (Herdsman or Plowman). As I made my first attempt to locate the "dirty snowball" through my binoculars, I almost immediately spotted a condensed "fuzzy" object very close to the area the comet should be. I wasn't convinced this was the comet as it resembled a globular cluster. From my experiences of deep-sky observing, I was convinced it was M3, a bright globular cluster located in the constellation of Canes Venatici, the hunting dogs of Boötes the Herdsman, very close to the border of Boötes. I then slewed my binoculars a few degrees to the southeast and there it was! 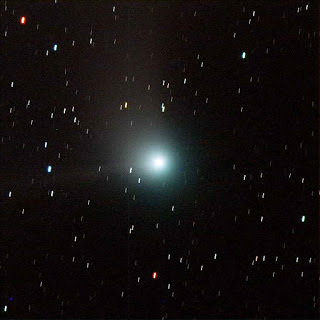 The comet appeared a much fainter patch of condensed light. 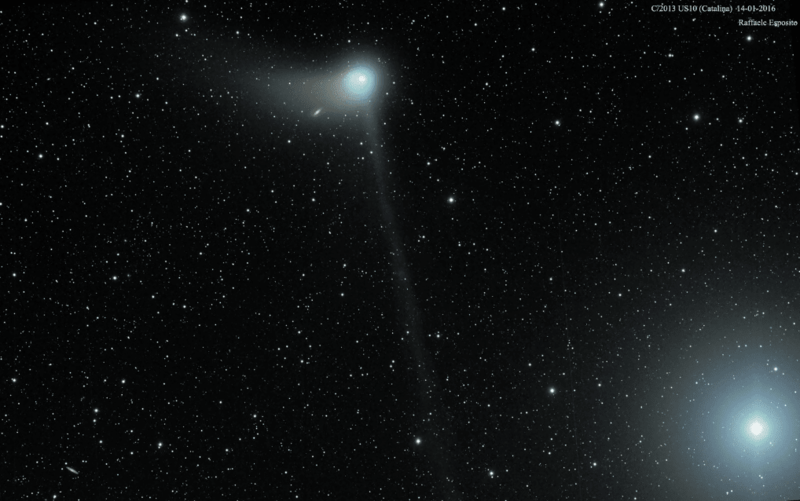 As twilight matured, the sky became brighter and the comet became harder to see. I leaned back against my SUV in the driveway and took in the amazing view of the planets lined up throughout the Zodiac. There was Jupiter to the west, Mars to the east, Venus, the waning crescent Moon, and last being Saturn in the glow of the sunlight. Comet Catalina - Imaged by Insight Observatory. After spotting Comet Catalina on that frigid morning, I was inspired to get a closer look at it with a 10" Dobsonian reflector telescope. However, the weather didn't cooperate the next day, so I waited one more day. Fortunately, the weather did provide another opportunity to observe the comet on the morning of January 7, 2016. The comet moved throughout the constellation within the few days since the first time I spotted it. The object was pretty much the same magnitude (brightness) as was the previous time I viewed it. However, this time, I could resolve the nucleus enveloped in a diffused nebulous "cloud" due to the higher magnification of the telescope. After studying the comet with the telescope that morning, the weather on the Cape was non-cooperative for close to a week afterward. However, surprisingly this past Friday, morning, January 15, 2016, around 5:30 am, the sky was perfectly clear. I went out on the front porch with my binoculars to see if I could locate it without any finder charts. I knew it was supposed to be near the handle of the Big Dipper from seeing images taken by others the previous days. I started scanning the area of the handle and spotted the comet again immediately. It seemed to have brightened a bit from that last time I saw it. The comet was very close to the last star in the handle of the Big Dipper named Alkaid. The bright star and Catalina were in the same field of view through my binoculars. It was quite a sight! Comet Catalina - Imaged by Raffaelle Esposito. Inspired by this view of the comet, I then went to my computer and logged into the iTelescope remote robotic telescope network (utilized by Insight Observatory) and connected to their telescope with a one-shot color CCD camera connected to it. The telescopes were very busy that morning, however, T3 became available and I jumped on and imaged the comet for 5 minutes as pictured in this post. Later during the day on Friday, I came across a great image of the comet captured by Raffaele Esposito on January 14, 2016 (pictured left) with the bright star Alkaid and the spiral galaxy NGC 5448 behind the comet's tail. C/2013 US10 is an Oort cloud comet discovered on 31 October 2013 by the Catalina Sky Survey at an apparent magnitude of 19 using a 0.68-meter Schmidt–Cassegrain telescope. As of September 2015, the comet became apparent magnitude 6. The comet reached its perihelion (its closest point to the sun) at a distance of 76 million miles (122 million kilometers) on November 15 and as it slingshotted past the sun, Catalina reached a velocity of 103,000 miles per hour (166,000 kilometers per hour), which is almost three times the speed of NASA’s New Horizons spacecraft. The velocity means that the comet is on an escape trajectory from the solar system and will never return. The comet passes closest to Earth at 0.72 a.u. on January 12th, then buzzes Mizar in the Big Dipper's handle on January 14–15, hurrying along at the rate of 2° per day or 5′ an hour — fast enough to easily detect motion in 30 minutes or less. After mid-month, it's expected to fade quickly. Thanks, Dale. There was snow on the ground the morning I was out with the scope and it being early January, it reminded me of the O-TEAM days!